Disposable Hand-Controlled Electrosurgical (ESU) Pencil (Rocker Switch)(SW12200 Rocker Switch Series) - Shining World Health Care Co., Ltd.
Electrode: Blade 70mm Stainless Steel (Optional Non-Stick Surface Treatment). 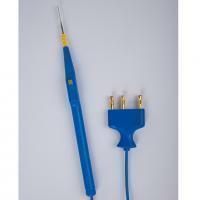 Standard - Blue for Pencil, Cable, & Connector. Optional: Any color difined by a customer. Optional W/ Tip clearer or Holster.